The interest rate is a special kind of price because it reflects exchanges through time. An annual interest rate of 5 percent says that in return for giving up $1,000 today, you can get $1,050 a year from now. Thus, $1,000 is the “price” of “buying” $1,050 in one year. To put it another way, you can get $1 in one year for a “price” of about 95 cents today. Of course, interest rates don’t have to be 5 percent. In the early 1960s, a one-year U.S. Treasury bond paid an interest rate of a little over 2.5 percent. Twenty years later, a similar one-year Treasury bond paid over 14 percent. As of this writing, the rate is a very low 0.65 percent. Private commercial interest rates tend to be higher. In 1960, the so-called prime rate was 4.5 percent. In 1980, it was 20.5 percent. At the moment, the prime stands at 3.5 percent. The figure displays three different interest rates since 1980. These are the 1-Year Treasury Bill rate, the prime rate at which banks historically lent to their most creditworthy customers, and the conventional 30-year mortgage rate. Four features of this data are noteworthy. First, there’s more than one interest rate at any time — a lot more. There’s also the London Interbank Offered Rate (LIBOR), the AAA corporate bond rate, and municipal bond rates. That’s just for starters. There are many other interest rates that you could quote. Luckily, financial markets are integrated. 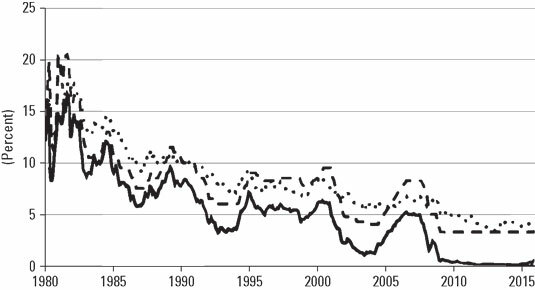 So, as the figure shows, these interest rates all move together similarly over time. That’s why macroeconomists can talk about “the interest rate” as a proxy for all them. Second, while the different rates do move together, they also move around a lot. A good part of this has to do with inflation, but not all. Fiscal and especially monetary policies can play a major role, particularly in the short run. Third, interest rates are quoted in loan markets where someone — a homeowner, business person, or government — wants to borrow funds. In this important sense, interest rates are best viewed as the price of credit. Finally, interest rates are typically positive, even after correcting for inflation. That is, the real interest rate generally exceeds zero. Why it does is a question asked by economists, philosophers, religious writers, and many others.